The Queensbury Hotel on Ridge Street in Glens Falls opened in 1926, and was built by the Glens Falls Hotel Corp. Inc. The five-story building was intended to be Glens Falls' centerpiece hotel, and was originally proposed by the Glens Falls Chamber of Commerce in 1916. Eight years later, a group of 100 local businessmen voted in favor of raising necessary funds for the project. Three sites were considered for the hotel, and the plot on the corner of Ridge and Maple Streets was ultimately chosen over sites at the intersections of Bay and Maple Streets and Glen and Pine Streets. Ground was finally broken in 1924, and the two-year project cost around $760,000 at the time (the equivalent of $10.5 million in today's dollars). According to local historians, the hotel is named after the British Queen Charlotte. The 1762 grant of the parcel of land that is now Glens Falls was named after her, and The Queensbury's moniker honors that grant. Other theories about the name are that "Queensbury" sounded elegant and that the English-sounding name had a broad regional appeal. Over the years, the hotel underwent a number of expansions and upgrades, including the addition of a 56-room annex in 1929, a new cocktail lounge in 1934, and new guest rooms in 1973. Perhaps the biggest change in the hotel's history took place in 1985 when an indoor pool, additional meeting rooms, and banquet facilities were added. 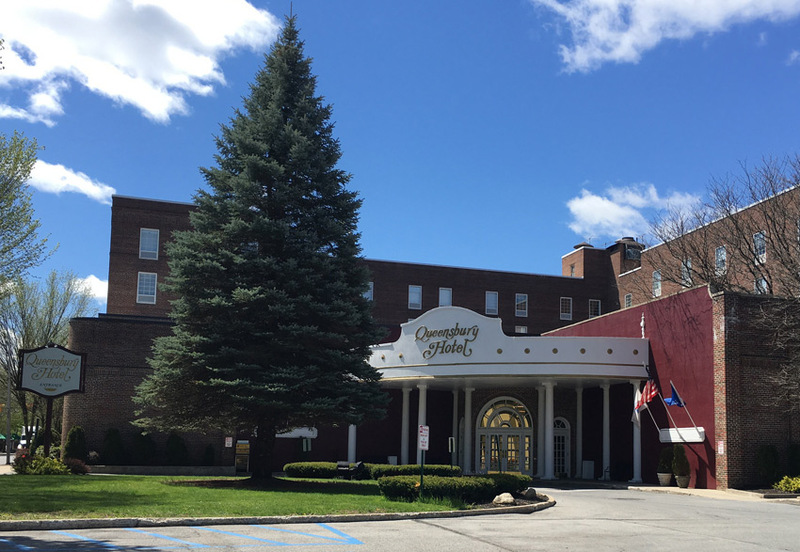 In its heyday, the hotel attracted big names in entertainment, including Benny Goodman and Guy Lombardo. These stars would give performances in the hotel's ballroom, which served as a popular venue for such acts until the Glens Falls Civic Center opened in 1979. Because of its close proximity to the Civic Center, The Queensbury continued to host big-name stars when they performed at the arena. Politicians and athletes who were in the area for various reasons were also known to book rooms at the hotel. Celebrities who have stayed at the hotel over the years include Mike Tyson, Louis Armstrong, Bob Dylan, Kenny Rogers, Bob Hope, Ozzy Osbourne, Kenny Anderson, and Ronald Reagan. Robert F. Kennedy famously visited The Queensbury in 1964 after being elected to the U.S. Senate. The Glens Falls Hotel Corp. that built the hotel owned it for three decades, and since then the building has had a number of other owners. In 2016, The Queensbury was brought back under local ownership when businessman Ed Moore purchased the property.